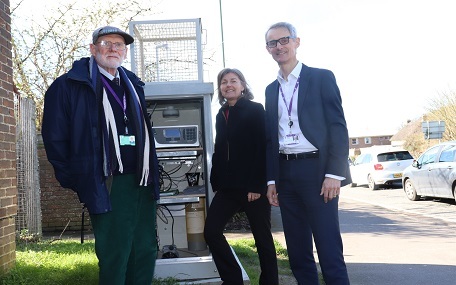 Air quality at Westhampnett Road will be monitored by Chichester District Council, now that an air quality monitoring station has been installed in the area prompted by residents' feedback. The station monitors the level of nitrogen dioxide pollution to ensure that the National Air Quality Standards are met. These are a set of standards local authorities must aim to meet in order to protect people's health and the environment. If an area is found to be exceeding the standards, an Air Quality Management Area must be declared. This then requires the local authority to produce an Air Quality Action Plan which lists the measures to be taken to reduce air pollution in order to meet the requirements of the standards. "Clean air and low levels of pollution are a key priority for the council, and installing a new air quality monitoring station is just one of the steps we are taking to protect our district's environment," says Councillor John Connor, Cabinet Member for the Environment at Chichester District Council. "We already monitor the level of pollution in other key areas of the district and the location of this new station at Westhampnett Road was chosen based on previous monitoring results and following feedback from residents in this area. "To ensure we can get an accurate picture, we will need to monitor for a number of years. This is because a number of factors can affect the readings taken at the station, for example, wind direction and wind speed. "After this, we will review the data and if needed, put into action any measures necessary." For more information about pollution and air quality please visit our Pollution page.